If you aren't familiar with how to describe the umami flavor, you are not alone. It's very difficult to discern. I would describe it as that salty sensation you experience when drinking really good Japanese green tea despite the absence of actual sodium. To a finely trained palate the same sensation can be experienced when eating all sorts of meats and vegetables, but is likely often confused with saltiness. Umami was kind enough to provide us with a private room for our happy hour but the tables in Umami's party room are just awful. They are situated below the floor and getting into the both is intimidating for a rickety old man like myself. I'm always inclined to lean on the table as I bend down to enter the booth and this creates a sensation of absolute terror as the tables are not bolted to the floor. The food is worth the visit, even if the seating is uncomfortable. 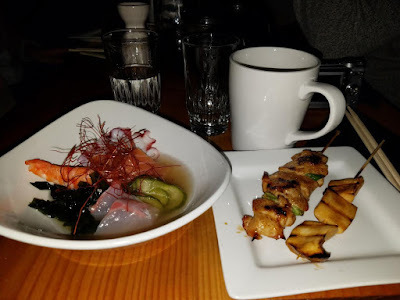 During my two trips to Umami I've tried every item on Robatayaki menu. The chicken thigh is a steal for $2.5 and some of my other favorites were the shrimp ($2.5), chicken skin ($2.5) and king trumpet mushroom ($3). On my first visit I sampled the chirasi, this time I ordered the Sunomono. A raw fish salad with cucumber, rice vinegar, shrimp, striped bass, wakame, salmon, octopus. It was absolutely lovely, I only wish it had been a little larger. However, I thought it was appropriately portioned for the price ($12). The only real disappointment during my visit was the gemimacha tea. I love green tea, but I just can't make myself like gemimacha no matter how hard I try. The crisped rice adds an astringency that I do not enjoy. I certainly can't blame the restaurant though as I ordered green tea without properly inspecting the menu.